Stole this off of Mike Smedley's facebook page. Next time fishing is slow I will start looking in my clients coolers! Why Shouldn't I Bring a Banana onto a Fishing Boat? Almost all old boating and fishing superstitions originated centuries ago on huge sea-bound merchant and fishing vessels. Over the years, many of them have made their way inland to the rivers and trout streams of the Colorado Rockies. One of the more common and also misunderstood superstitions is this: it is bad luck to take a banana with you onto a fishing boat of any kind. I am writing this because I see it happen from time to time. An innocently uninformed customer will manage to sneak a banana past my vigilant eyes, and the unlucky snack will make its way aboard the drift boat before a day of fly fishing. After witnessing the consistent calamity and bad luck that follows, I am convinced that it is not coincidence, but consequence. The ultimate test came this fall during a FeakNFish float trip on the upper Colorado River. To simplify a long story, not a single fish was hooked or seen until after lunch when the banana was discovered and thrown overboard. Almost immediately we began catching fish, and were able to bring in a good day's worth of above average sized brown trout. You could say that the sudden change in productivity was due to rising water temperature or some other change in conditions, but I firmly believe it was the banana. According to old tales, we were lucky things weren't worse. Stories of banana induced misfortune date back to the early 1700s in the Caribbean sea. Many of the wooden sailing ships that carried bananas had to travel quickly in order to get the fruit to its destination before spoiling. Crew members that were trying to fish along the way caught little due to the boats speed. Another explanation is that when another ship came upon the scene of a deadly shipwreck in the Caribbean sea, many times the only visible sign of trouble were the floating cases of bananas bobing up and down in the open ocean. This led to the superstitious belief that the bananas themselves were to blame for the lives that were lost. Probably the most reasonable suggestion is that bananas provided a way for venomous spiders to get on board the cargo ships, and eventually expand their territory to the crew’s living and dining quarters. Spider bites could not be treated easily at sea in the 1700s and many became fatal. The deaths were again attributed to the bananas. No matter the accepted reason, here in the 21st century, bananas are still forbidden on most recreational fishing vessels. Offshore captains in the Gulf of Mexico and the Florida Keys have been known to even include Banana Boat sunscreen and Banana Republic clothing in the list of things not welcome aboard. Things are a little more relaxed here on Colorado’s western slope. I can’t say that I have ever noticed an impact from the wrong brand of sunscreen or clothing, but the presence of the fruit itself has definitely ruined some potentially great days of fishing. Superstitious or not, every angler should think carefully about his or her potassium intake before climbing aboard any fishing boat, even if it is a drift boat on a trout river in Colorado. nearby an irregular feature. At Anna it doesn't take much for Bass to relate to. We caught 2 Bass at once here, both were 3 pounders. 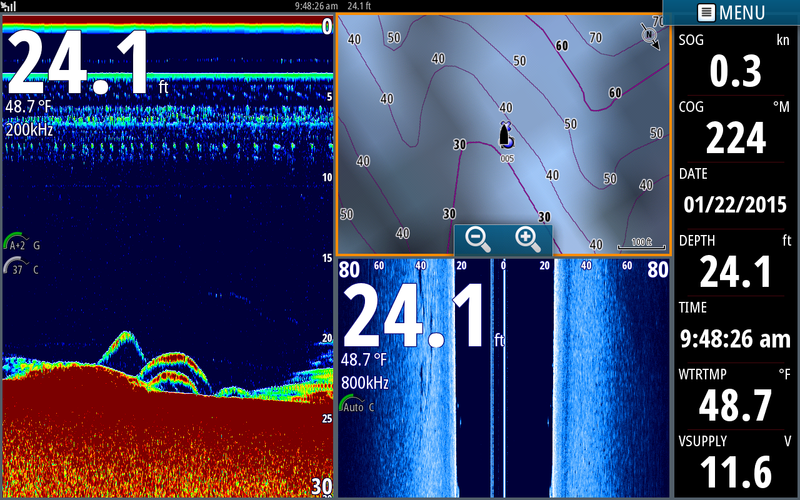 flat and hit Stripers at 35 feet.You can see 4 of the baits [long horizontal lines] we were pulling between 20 and 25 feet deep. There were 2 rods on the back of my boat and 2 rods eight feet in front of the other 2. The lower bait gets hit and the fish pulls drag as it heads for the bottom. Once I noticed the school I slowed the boat down to about a quarter mile per hour. The baits dropped down into the fish and they got jammed. We needed more help here reeling in these fish than we had on the boat. Guess what type of fish these were???? Wrong.....Largemouth Bass! I had left my Navionics card in my Lowrance that I was demoing at last weeks boat show so I had my map on Insight. 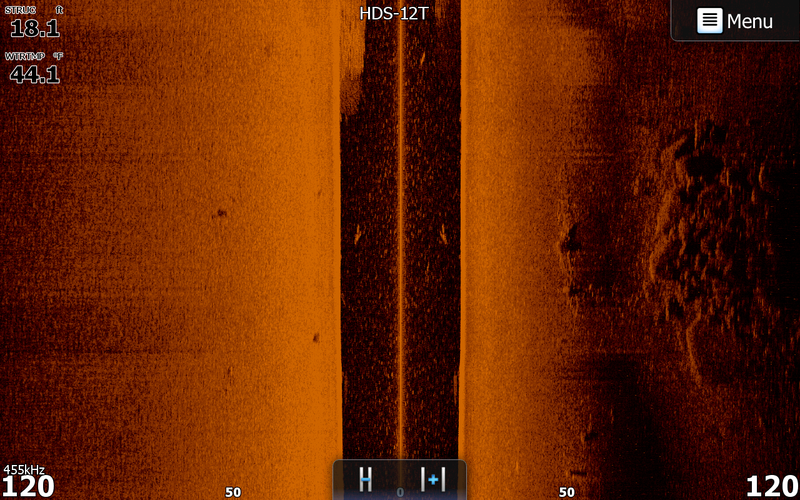 The sonar page is showing a couple fish at 22 feet. It also shows some of our baits being pulled through the fish. 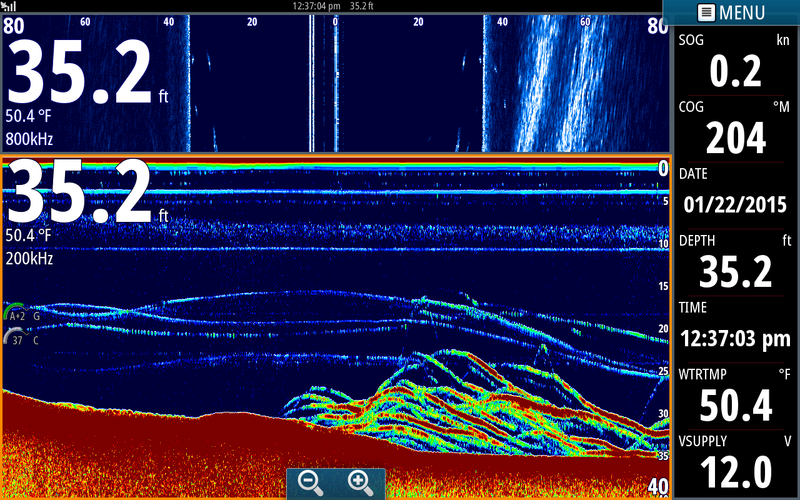 The squiggly line near the bottom and then rising to the surface is a fish we were fighting for awhile. It made a run to the bottom then we tired it out and could reel it to the boat. 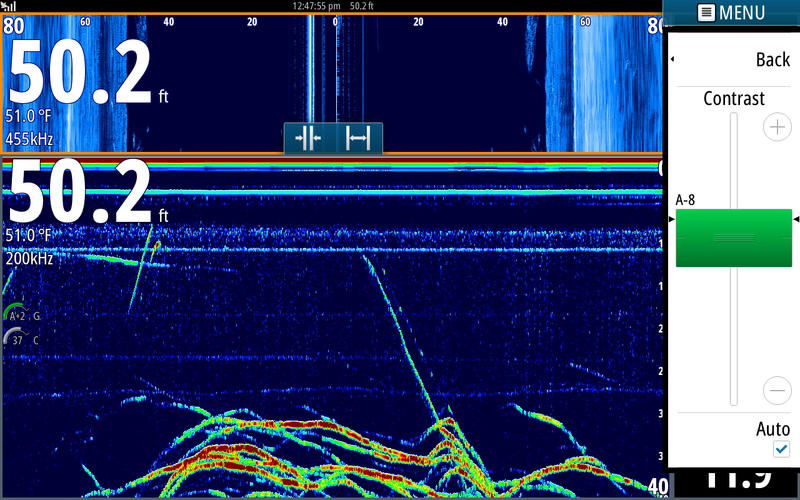 In this shot we are over 50 foot of water and had been pulling baits around 25 feet deep [2 horizontal light lines]. I noticed the fish were deeper and not rising up to attack our baits so Anthony dropped a down line [vertical line] down till I told him to engage the reel. Three seconds later he hooked up. These fish relating just to the bottom with no irregular features around them are a pod of Largemouth. 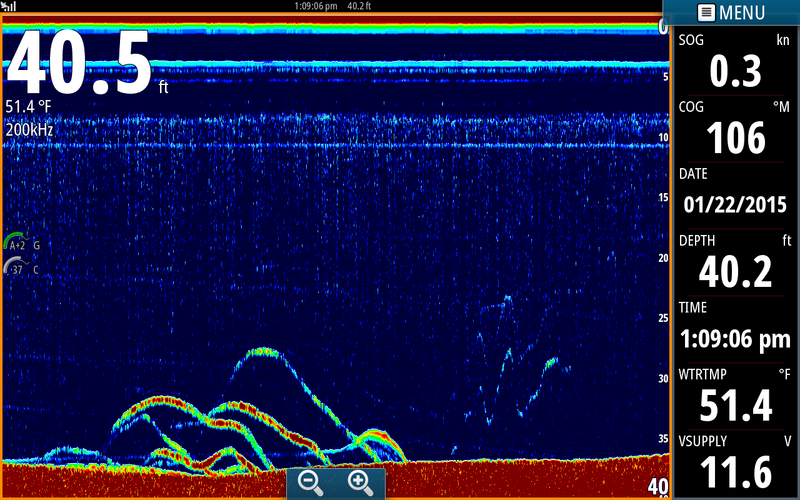 You can barely see 3 baits being pulled through the water column at 23, 28 and 32 feet of water. The bottom bait hooked up and you can see Greg fighting a 23 inch Citation Bass to the boat [ziz zag marks to the right of the Bass]. I have been off the water for 2 months. It was so foggy we could only see 1 boat length ahead of the boat for about 4 hours. 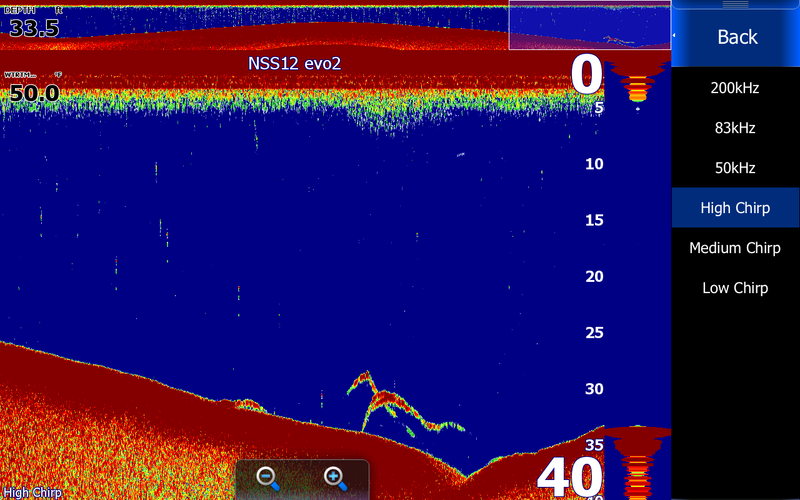 I could not run to where I wanted to fish so we relied on our Simrad and Lowrance to locate fish for us. I idled out of the ramp and eventually started seeing fish. We simply put baits in their faces and started catching fish. Once the fog lifted we were still in sight of where we had launched. We caught all these fish in an area that I seldom fish. Why?????? because I trusted my electronics! Too many anglers own expensive Locaters and don't use them to their advantage. They fish the same areas every time they go out, they look for other boats catching fish or search for birds to tell them where the fish are. They call their friends up before going fishing asking "Where did you catch bait or where did you catch fish or where is Hemby, Cobb and Harris or some other good fisherman fishing". You paid for the Depth Finders, USE them. Take the next step. Forget where you use to catch fish, fish move constantly. Don't look for other fisherman to sneak up on or fish their areas after they leave, go find fish for yourself. I guarantee you will become a better fisherman and certainly feel better about yourself going out and locating your own fish. Fishing is so rewarding for the ones who work to find their own fish. Chances are you will catch not only more fish but bigger fish working areas that are seldom fished. If you need help learning how to use your depth finders get some friends together, book a trip , catch some fish and go away with the confidence to go out and do it on your own. Anthony holding up one of 30 Stripers we caught today. Greg with a 23 inch Citation Bass. This is one of 10 Largemouth Bass we caught today. We are holding it over the Simrad for a reason. 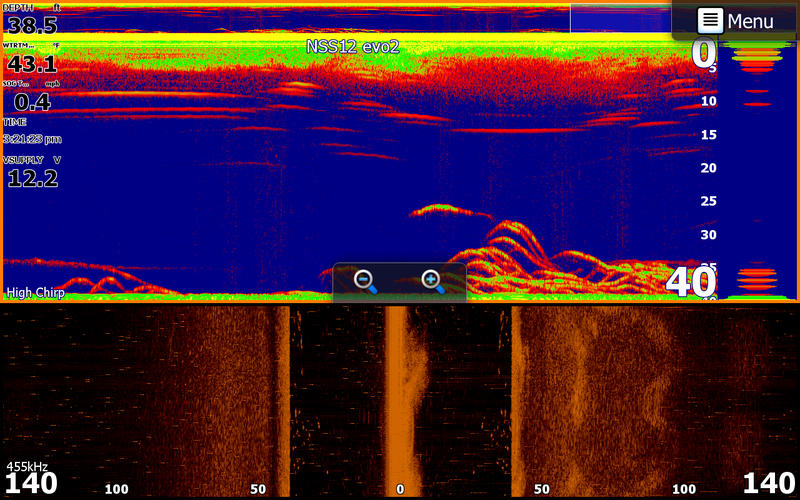 People at the show kept asking me what Largemouth look like on my Simrad. Well, here it is. 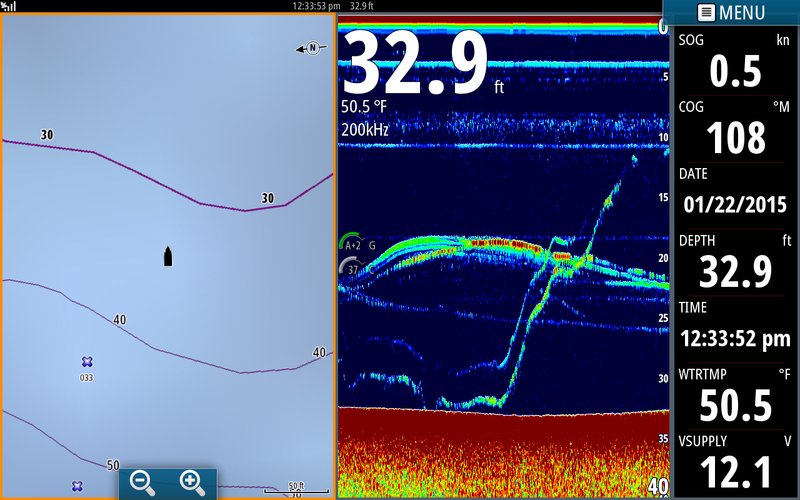 No, I am not being a smart a__ showing the Bass laying on the Simrad. If you look at the screen the fish on the bottom are all Bass. We hooked up on a down line when we went over them and I went back in my history to bring up the exact spot they were holding on. As you can see these Bass were not relating to a thing, just like Every Bass we caught today. Greg's Bass came on a planner board over 42 feet of water. At the same time we had two other Bass hook up. They were not relating to any structure. I took a couple screen shots that I may post tomorrow showing the Bass coming up off the bottom and hitting a bait 15 feet above it! It probably would have been a great day to throw jerk baits. We each wanted to keep 2 Stripers today for a good diner so we kept these 6 fish and released all the others to fight again. I have been off the water for well over a month now [hunting and some good time off] but we're back and the fish want to eat our offerings. February is traditionally a great month to fish and a good month to catch Big ones as well. If you get cabin fever I have the cure, works every time. I will be posting some nice stringers of Stripers in the near future. Well here we are. Hunting season is over, just finished the only show that I will be doing this year and getting my two boats ready to get back on the water this week. I enjoyed my time off but like many things in life all good things must come to an end. My guides and myself will return to the water this week, locating bait and Big Stripers. We met and introduced Striper fishing to a completely new clientele at the show, anglers who did not realize what a great Striper fishery Lake Anna has. I was surprised how many people were unaware that Lake Anna was a year round fishery with generous creel limits. Anglers can keep 4 Stripers per day per person over 20 inches. Some of the people that I talked to at the show did the math and said "Gosh, if I come fishing with you and bring 5 other friends we could keep 28 Stripers, that's almost as many as we kept all year fishing out on the bay". I told them we can't guarantee limits daily but the lake is definitely capable or producing nice stringers of Stripers. Many people were also excited about fishing on a calm lake versus contending with the rougher salt water places that they are accustomed to. Shoot us an email to Jim_Hemby@hotmail.com if you want to get out and try some winter fishing for Stripers, you will be glad you did! What a way to bring in the new year! 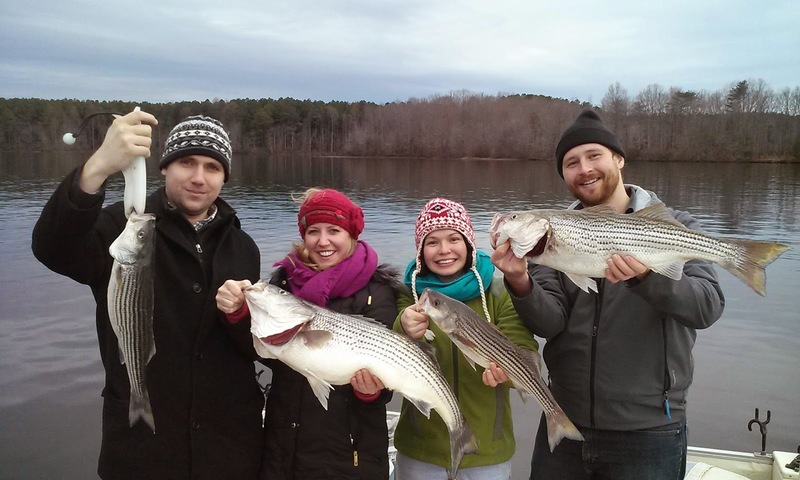 Guide DP took this hardy crew out yesterday for a great day of Striper fishing on Lake Anna. Although it was cloudy there was minimal wind which made the day even more enjoyable. They are holding 4 of the 22 Stripers they caught yesterday. Hunting season is finally over today and all of our guides will be hitting the water again to get dialed in on the Big un's.